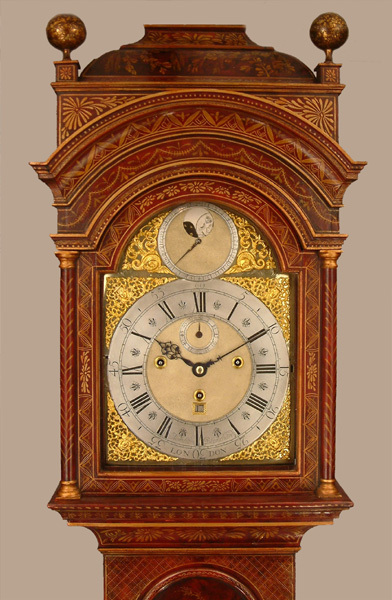 Abraham Blanchard Longcase Lacquer Circa 1735 - Height 95in. This Longcase Lacquer Archive's Maker - Abraham Blanchard. Recorded apprenticed to Maynard Borijel of St. Anns, Westminster, 1719 for 7 years at a cost of £20. Watch known 1730 ( presumably from hallmark date letter ) also recorded ante 1744. Stunning dark red and gilt chinoiserie decorated case with caddy top and typical London two step base. Side windows to hood. Gilded gesso wooden ball finials. 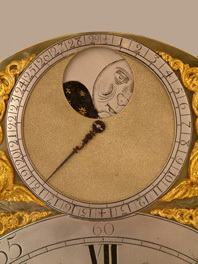 12" breakarch brass dial having dolphin flanked penny moon to arch.Finely matted dial centre, subsidiary seconds dial, "Indian head" spandrels and delicate engraving between details.Finely cross hatched date box, date advance lever at 9 o'clock position, balanced at 3 o'clock by S ( strike ) and N ( not strike ) lever.Turned winding colletts. Exceptional movement with 6 finned and knopped pillars, quarter striking on 8 bells with hourly ( rack ) striking on a further single bell. Abraham Blanchard. Recorded apprenticed to Maynard Borijel of St. Anns, Westminster, 1719 for 7 years at a cost of £20. 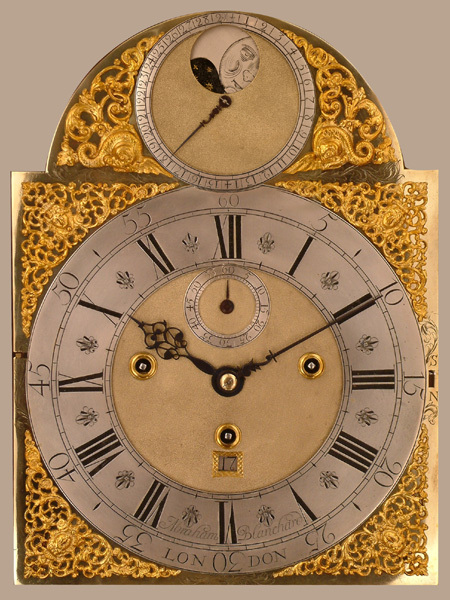 Watch known 1730 ( presumably from hallmark date letter ) also recorded ante 1744. 95" ( 241 cms. ).